The Punjab bandh call given by the All India Sikh Students Federation (AISSF) and other Sikh organisations evoked a mixed response in the state. A potentially volatile situation was defused by the district police as they made elaborate security arrangements in the city and its neighbouring towns such as Dinanagar, Dhariwal and Naushera Majha Singh. Activists of various Sikh organisations blocked the railway track near Gurdwara Dukh Nivaran Sahib at 5 in the morning for more than four hours. The bandh call by Sikh organisations today failed to evoke any response in the district as commercial establishments functioned normally in Muktsar, Malout and Gidderbaha towns. Though some Sikh activists took out a march in Muktsar forcing traders to shut their shops, the latter refused to follow their diktat. The activists had a verbal duel with Beopar Mandal chief, but the tension was defused after police intervention. The response to the bandh called by All India Sikh Students Federation (AISSF) and survivors of 1984 anti-Sikh violence, across state today cannot be seen as a revival of radical forces in the state. But it definitely shows that despite the fact that monetary compensation was announced, there is no closure for the victims and various political outfits still thrive on it. The yesterday’s incident of a BJP leader and his son allegedly beating up a security guard at Guru Gobind Singh Medical College and Hospital here has landed the police in a difficult situation. Factionalism within the Sangrur District Congress Committee (DCC) came to the fore today with two groups exchanging blows at a meeting here, held under unit president Mai Roop Kaur Bagrian. The elections to 122 municipal councils and six municipal corporations in Punjab, scheduled for December-end, would be a litmus test for the “strained” Akali-BJP alliance in the state. Ahead of the local body elections, the BJP launched its digital membership drive here today. A local court today sentenced three-year imprisonment to four policemen for detaining and torturing a man in a 10-year-old case. In an embarrassment of sorts for the state government, the Punjab and Haryana High Court has observed that reservation in plots meant for Scheduled Castes was possibly being misused by the powerful and affluent SC families or the general category persons. SGPC president Avtar Singh Makkar has laid the foundation stone of Global Sikh Centre for Learning and Information at Yuba City in the US. The centre has been set up with an aim to deal with issues such as Sikh identity in the US and Canada. There was a complete bandh in the holy city. Most educational institutions and commercial establishments remained shut. On their toes since morning, the police arrested 200 persons, including AISSF chief Karnail Singh Peermohammed and riot victim Bibi Jagdish Kaur, as a preventive measure. A police team led by Additional Commissioner of Police Manminder Singh rounded up around 50 activists of the AISSF led by the duo as they ventured out in the city to disrupt rail and road traffic around 5.30 in the morning. Sikh Students Federation (Mehta) leader Amarbir Singh Dhot was arrested when a group of activists led by him tried to disrupt rail traffic at Jaura Phatak. Similarly, Sikh leaders Gurjinder Singh and Kanwarbir Singh Gill were detained near Shaheedan Sahib Gurdwara and Hall Gate, respectively. Though the Sikh activists failed to stop any train in Amritsar, some major trains got delayed due to protests in Ludhiana and Phagwara, leaving the passengers stranded. Among these trains were Amritsar-Saharsa Garib Rath, Amritsar-Delhi Superfast Express, Shan-e-Punjab, Chhattisgarh Express, Howrah Mail, Tata Muri Express, Chandigarh-Amritsar Superfast, Paschim Express and Shatabdi Express. Activists of a couple of Hindu outfits also marched towards the Hall Gate to protest the bandh, but were stopped by the police. Talking to The Tribune, Peermohammed said the bandh was largely successful in the city for which he also expressed gratitude to the Hindu community. He said the police had detained around 50 activists of the AISSF alone while the number of total detentions was far more. 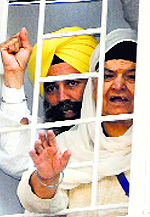 He lashed out at the state government for detaining 74-year-old Bibi Jagdish Kaur who lost her husband, son and three brothers in 1984 riots. Similarly, AISSF (Bhoma group) chief Manjeet Singh Bhoma said their struggle would continue till the guilty were punished. Jatinder Singh Aulakh, Police Commissioner, said the bandh was peaceful in Amritsar while those detained were let off in the evening. He said no case was registered against any of the activists of Sikh organisations. 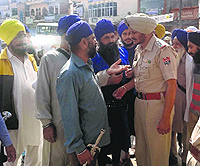 Tarn Taran: The police today detained six activists of various Sikh outfits who were trying to block road traffic here. A case was registered against Sukhjit Singh Randhawa, president, Danga Peerat Welfare Society. Those detained were released in the evening. 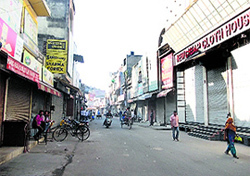 The bandh call evoked a mixed response in the district. Attendance in schools and colleges was comparatively less. Bus service was affected. The supply of fodder, milk and vegetables was hit. The bandh call had a mild impact in Hoshiarpur district. Shops remained closed for a few hours only in the city. 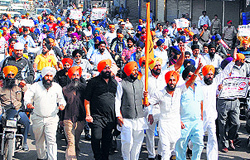 Sikh activists carrying swords took out a protest march in the city. They forced the traders to close their shops. Schools, colleges, banks and government offices functioned normally. The situation was tense in the city as a Hindu organisation had decided to oppose the Punjab bandh call given by the AISSF. Sources said senior police officers managed to bring about truce between the two warring organisations. Anti-riot police vehicles were stationed at various sensitive points in the city. Groups of blue turbaned Sikh youths kept on wandering around the markets trying to convince shopkeepers to down their shutters. "The activists did not use force and held a peaceful demonstration," said Gurpreet Singh Toor, Senior Superintendent of Police. The bandh fizzled out in the district headquarters here. The police had made elaborate arrangements to check any untoward incident. Police force in large number was deployed at the railway station, bus stand, Malout chowk and all along the railway track. Railway Superintendent Mahesh Narain said all trains at the Fazilka station were on time. 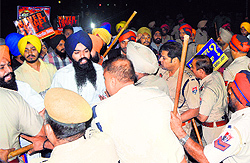 Sikh activists were not allowed to gather in any part of the town and in rural areas. Senior police officers said there was no report of any untoward incident. At least 15 trains were delayed. The Railway authorities said the Andaman Express was delayed by more than four hours and left the Ludhiana railway station at 9.20 am. All Delhi-bound trains were delayed. Shri Shakti Express Train departed at 9:50 am, four hours behind its schedule. Amritsar-New Delhi Shatabdi Express was delayed by three hours. It left the Ludhiana station at 10 am against its scheduled time 6:55 am. While Gareeb Rath Express was delayed by four hours, the intercity train from Amritsar to Chandigarh three-and-a-half hours, Amritsar-New Delhi Intercity Express more than four hours, Amritsar-Haridwar Express two-and-a-half hours and Janseva Express and Dadar Express two hours each. The trains going towards Jalandhar were also delayed. Amarpali Express was delayed by five hours, Amritsar-Dhanbad Express four hours, Malwa Express two and Dadar Express three-and-a-half hours. Surjit Singh of the 1984 Sikh Riot Victim Welfare Society said: "We had blocked the railway track in favour of our demand to constitute a SIT under the Supreme Court to probe the riots". The bandh call did not have any other impact. The bandh remained peaceful in the city. The police rounded up some activists. Most schools, colleges, shops and other commercial establishments remained closed. Passengers at the Jalandhar railway station were a harried lot. The bandh called by AISSF and other outfits was peaceful with no untoward incident being reported from across the state. However, it proves that the radical section in the Sikhs, which has never come to terms with the unsavoury events of the past, continues to have an appeal even amongst the moderate sections. Two years ago, the bandh in the support of seeking clemency for Balwant Singh Rajoana – who is convicted for the assassination of former CM Beant Singh - too had got mass support and for once, it seemed the state would be on the boil. But it turned out to be a one-off incident. Many amongst the Sikhs feel let down by the Sikh political leadership. Promises of holding a judicial inquiry into the anti-Sikh riots of 1984; failure to properly rehabilitate the victims and failure to punish those responsible for the anti-Sikh riots; and events preceding these in late 70s and 80s across the state; have remained unfulfilled. Rather those politicians promising to hold a commission of inquiry backtracked later on the plea that “they did not want to re-open old wounds”. Now, with the general perception that various political forces are trying to polarise the non-Sikh vote bank in the state, in preparation for taking over the reins of government, the response to today’s bandhs should set the alarm bells ringing. Political observers say that as news of a political party trying to consolidate and polarise the non-Sikh votes gains momentum, the other political parties in the state could tacitly support these radical outfits - to an extent that the Sikh votes get consolidated. In the past too, the consolidation of the Siikh votes has happened, every time the radical elements have become active. The lack of any opposition to this bandh call by political leadership in the state has added fuel to speculation that efforts are on to consolidate the Sikh votes. Though the police have lodged an FIR after the security guards went on strike today, they have not named the BJP leader and his son allegedly due to political pressure. The accused have been named as “BJP president” and “BJP president’s son”. The charges are criminal assault on a public servant to deter him from discharging his duty. In his complaint, Beant Singh (36), the guard, alleged that the BJP leader, his son along with several supporters tried to barge into the hospital’s intensive care unit to meet a patient. Beant alleged when he objected to the visit by so many people as it could have risked the health of other patients, he was thrashed badly by the BJP leader and his son. The police even have an alibi to offer for creating this obscurity. “As the complainant mentioned their names as BJP president and his son, we recorded the FIR verbatim,” said Sat Pal Singh, investigating officer. He said the accused would be identified and put behind bars within next 24 hours. Beant, however, said “the accused were well-known and influential persons of the town”. “The police did not nominate them in the FIR to weaken the case,” he said. As the complainant mentioned their names as BJP president and his son, we recorded the FIR verbatim... The accused will be identified and put behind bars within the next 24 hours. The accused are well-known and influential persons of the town. The police did not nominate them in the FIR to weaken the case... The BJP leader, his son and their several supporters tried to barge into the hospital's intensive care unit. I do not have any information about the incident. Nobody sustained injury even as Bagrian said she would report the matter to the party high command. The trouble started when a former municipal councillor, Darshan Kangra, started addressing the meeting. Former Sangrur Municipal Council president Harbans Lal objected to it, saying Kangra should not have been given the opportunity as he had indulged in “anti-party” activities. Harbans alleged that Kangra did not support him when he was removed as the council president through a no-confidence motion. A supporter of Kangra came out in his support and an altercation ensued. It reportedly was a free-for-all affair for some time as the supporters of both the leaders took on each other. One of the workers was even slapped, it is learnt. Kangra’s supporter was made to leave the venue as some workers tried to establish normalcy. The proceedings remained suspended for about 10 minutes. Speaking to The Tribune, Kangra blamed Harbans for the fight. He claimed the latter took to criticism without provocation. Harbans admitted he asked the party leaders why Kangra was given time to speak “as he had stabbed in the back” when a no-confidence motion was tabled against him. Bagrian said the incident was “unfortunate and it should not have happened”. Chandigarh: Congress deputy leader in the Lok Sabha Capt Amarinder Singh on Saturday said he supported the agitation launched by residents of Ferozepur and surrounding areas demanding resumption of train services to Chandigarh via Ludhiana. In a statement, Capt Amarinder blamed Chief Minister Parkash Singh Badal for the delay, saying the train would “impact his transport business”. It will be seen whether the two allies contest these local elections as one or continue to jostle with each other over seat-sharing, thus yielding political space to their opponents. Though publically both the sides claim that the Akali-BJP alliance was intact, the delimitation of wards in several municipal council areas and new municipal corporations has already led to disagreement between the local leaders of the two alliance partners. While the SAD claims the seat-sharing formula would be the same as during the previous local body elections, the BJP would want more seats in areas where it felt it had strong vote bank. Punjab BJP president Kamal Sharma insists that post-delimitation of wards, they have a greater presence in category A and B towns, thus they should be contesting more seats in these areas. Though the Akali leadership initially had scoffed at these suggestions, they may have to change their stand in view of the aggressive posturing of the central BJP leadership, as was evident at the swearing-in of the Haryana Chief Minister on Sunday. The Akali leaders now maintain that there was no set formula for seat-sharing, and that winnability should be the only criterion. “Committees with equal representation of Akali and BJP leaders are being formed at district level. These committees are deciding which candidate is to be fielded from a particular ward. In case of any dispute, the matter will be referred to the state-level joint Akali-BJP committee,” said a senior Akali leader. The process of making these committees at the district level is now on and the Akali leadership is cautious of involving BJP members in the candidate-selection process. This surely is a new trend in the SAD-BJP alliance where the Akalis have always had the final say. With the BJP leadership pulling many a surprise for its alliance partner and projecting itself as the new “messiahs” of Punjab, the Akali leadership for once has been left squirming. Sources in the Local Bodies Department said the final drafts for ward delimitation had been submitted to the State Election Commission for 32 municipal councils (of the total 122). It is only in six councils, Rajpura, Dera Bassi, Fatehgarh Churian, Dera Baba Nanak, Gurdaspur and Patran, that the draft notification for ward delimitation has not been done. For new municipal corporations, draft notification for Bathinda, Moga and Phagwara is pending with the Local Bodies Minister for approval while draft notification for Hoshiarpur is ready. In Mohali, the ward delimitation process is nearing completion, but in Pathankot the process is still on. Those convicted are Assistant Sub-Inspectors Ajmer Singh and Bikram Singh, Head Constable Gurjant Singh and Constable Sahib Singh. Judicial Magistrate Gurjit Kaur Dhillon pronounced the punishment after finding the quartet guilty of illegally detaining and torturing Manjit Singh at Kot-ise-Khan police station for three days. He was picked up on July 21, 2004, from his residence on the pretext of inquiry in a drug smuggling case. Manjit’s wife Surjit Kaur filed a habeas corpus petition in the Punjab and Haryana High Court, but the warrant officer appointed by the court could not release the victim from the police custody. It was learnt that the policemen shifted Manjit from the police station’s lock-up to an undisclosed location a few minutes before the warrant officer arrived there. Surjit then approached the Punjab Human Rights Commission. The commission marked her application to senior police authorities for an inquiry into the allegations. The inquiry held them guilty. A case under Sections 323, 343, 365 and 384 of the IPC was registered against them on July 29, 2005. The observation came after the High Court took note of the fact that a large chunk of land reserved for the Scheduled Castes in a village in Sangrur district was being auctioned without bifurcating it into reasonable size plots. The High Court also made it clear that the government needs to come out with a policy for limiting the maximum area of a plot, reserved for Scheduled Castes, for which a family could bid. The Bench of Justice Surya Kant and Justice Shekher Dhawan has also treated a petition filed by a gram panchayat as a matter of public interest before directing its placement before the Bench concerned. The directions came on a petition filed by Guru Ravidas Ji and Saheed Baba Jiwan Singh Ji Committee against the State of Punjab and other respondents. Taking up the matter, the Bench observed: “One of the paramount issue of public importance raised by the petitioner-society is as to why a big chunk of land measuring 530 bighas reserved for Scheduled Castes in Bald Kalan village in Sangrur district is being allowed to be auctioned as one chunk instead of bifurcating it in various plots of reasonable sizes to ensure real social justice and inclusive growth of the non-proprietors agriculture community belonging to Scheduled Caste. “The facts brought by the petitioner-society, if were true, clearly suggest that this is yet another form of reservation meant for Scheduled Castes which being misused by high/affluent Scheduled Caste families or general category persons. Spread over 14 acres of land donated by businessman Deedar Singh Bains, the centre will also house Sri Guru Granth Sahib Bhawan where the "birs" of Guru Granth Sahib and other religious literature will be kept. Makkar said the centre would help the community in dealing with issues such as “mistaken identity and security barriers”.